Dogs are amazing creatures- they’re loving, kind, smart and oh-so-beautiful… But they’re also very messy and love to run through everything from fox poo to massive, muddy puddles. If you’re reading this and nodding along in exasperation, then just know that we’ve got you covered. 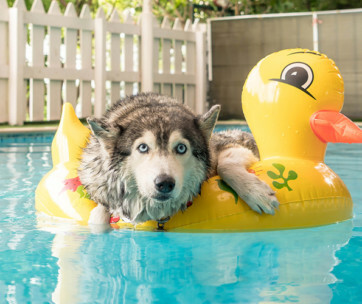 Whether you’re looking at investing for a future business purchase or simply want the best dog bathtub we’ve scoured the internet to bring you our favorite bathtubs for dogs. 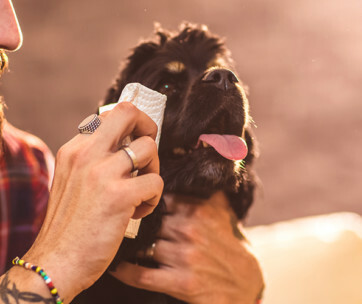 After all, it’s no secret that dog grooming baths are amazing additions for those who love their pooches- but don’t love the mess that comes with them! Our top pick is this durable, lightweight and portable option from Booster Bath. Providing an elevated tub for your pup, this dog bath comes with a three-point restraining system to ensure your dog’s safety as you give them a scrub. Easy to fit together and made from a UV stabilized plastic, with rubber feet and mat area to ensure no movement as you work, this dog wash tub comes with a shower caddy to store all your lotions and potions. Not only that, but the added hose allows for easy draining, once you’ve finished your task, meaning there’s no need to get soaked with dirty water, once you’re done cleaning! A great dog tub that is somewhat reminiscent of a baby bath, this steel-footed, portable bath tub with a heavy-duty plastic basic comes with an easy-drain plug and three points for a harness system. This allows you to use your own harness or buy a restraint that is compatible with the basin and your dog’s collar. This isn’t the largest size in terms of the dimensions given but this dog bath can still hold up to an impressive 150lbs. Perfect for puppies, toy breeds and small-to-medium sized dogs, this is a hard-wearing bath for dogs that won’t rust and is surprisingly portable, as it comes apart fairly easily for such a sturdy option. Looking somewhat sanitary with its strict, rectangular shape is the Utilatub from Mustee. This is a one-piece molded tub, made from polypropylene and heavy-gauge steel legs, which can be adjusted to suit any floor type. All-in-all this is a great indoor and outdoor dog bath that does well to resist mold, mildew and general staining. Customers love the stability of the BigTub Utilatub and note that the straight edges make this an ideal dog bathtub to fit into a dedicate space around the home- ideal if you’re looking for a dog bath that can easily be plumbed into your garage or similar. A surprising number of reviews also mention that it doubles-up well as a great sink for their laundry room, as the tub is so large and so easy to clean. With two quick-connect leash restraints attached to this Pup Tub from Pet Gear, this is a great option for those who have a new puppy, or own toy breeds. An ideal first step into the dog bathing world, this is a simple design that works well to gently encourage bath time with your dog. With a non-slip matting and rubberized grippers on the base of the tub, this is a sturdy little dog bath that will help with any slips that might occur, as well as making it easier for your dog to get in and out of their new tub. It also comes with an easy-drain plug, although you’ll need to make allowances for picking up the bath or placing something underneath to catch the water as, unfortunately, this tub lacks any legs and therefore needs to be laid on the ground. A huge outdoor dog bath that works well as a swimming pool, too. Great for kids and dogs alike, this is the best way to cool down your dog in the summer months or simply give them a scrub down after a walk or messy playtime. Of course, it’s large size will require a considerable amount of outdoor space, so be sure that you can fit this pool and dog bath into your garden before purchasing. It is, however, super easy to set up, as this dog bath doesn’t require any inflating- simply pour in the water to your preferred level and you’re good to go. It’s also just as easy to drain, as a twist-off cap is simply removed to allow the pool to drain. 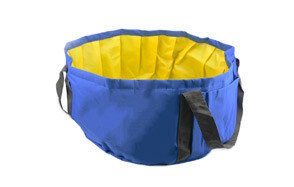 Finally, it folds up nicely, allowing you to easily store this pool and dog bath, or bring it with you on family trips. 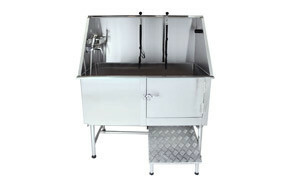 As one of the best commercial-grade, pet grooming dog baths on the market, this professional, stainless-steel dog tub from Flying Pig Grooming is an ideal investment if you’re looking to set up your own business- or have a lot of heavy-duty dog cleaning to do at home. The adjustable floor grates allow for comfort, no matter what size dog you’re working with and the removable backsplash and side splashes allow for greater versatility while working, too. This is easily the most expensive option on our list but comes with the greatest flexibility too. The materials are rust-resistant, and the dog grooming station comes with walk-in ramp, faucet with cold and hot water hose, sprayer with hose, overhead grooming arm, drain kit and hair trap, floor grates and Stainless steel shampoo rack. Making this the best all-in-one bath tub for commercial dog grooming. A brighter, quirky option from Master Equipment is the Everyday Pro Tub, which comes in a variety of eye-catching colors. Compared to other, commercial-grade dog baths, this is easily the most affordable, although some customers have complained that this can rust very quickly- so, be sure to dry your Pro Tub after every use to avoid this. 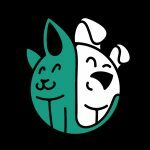 Nevertheless, this is still a quality option for those who are looking into setting up a business and want to check their potential before investing too heavily, or simply those who want the security of plumbed dog baths without the price tag. A rather adorable puppy bathtub from LILY’S PET, this portable small dog bath tub is a great option for owners of toy breeds, puppies or simply those who want the ability to clean paws and tails, while on the go. The added storage pockets on each side allows you to bring along everything you need to wash your dog, on the go without worrying about jumping back and forth, too. Designed to be taken anywhere and filled easily, this is easily the best portable dog bath tub on the market, today with an amazing price to match. Easy to use, quick to fill and able to fold down to an easily-portable size, this little wash tub for dogs is great for those who like to do a lot of travel with their dogs. Light weight and easy to carry, with ergonomic handles and a collapsible silicone basin, the Porta Tubby bath tub from BaileyBear is perfect for small dogs and puppies. Although there isn’t a huge depth to be had with this dog bath tub, it’s still a fantastic option for those who want to take their dog bath tub on their travels. You’ll also be pleased to know there are three different depth settings, which is great for growing puppies or even those who want their dogs to get used to being in a bath, with gentle increases in the amount of water used. Simply adjust the placement on the rubber-tipped legs for different sizes, to suit you. Our final choice is another option from Flying Pig Grooming, with this particular size being great for dogs up to 190lbs and around 38” long. Of course, the removable sides and backsplash do allow for some larger dogs and greater versatility in terms of how to clean your pup, too. The leg levelers allow for adjustable heights to suit you and the easy plumbing system work for any and all water pipe configurations. Even better, this grooming station comes with a faucet (with hose), sprayer (with hose), shampoo rack, restraint eyelets and green rubber floor mat to ensure no clumsy slips and trips, as you work. If you’re looking to set up a dog grooming business, or already have one on the go, then you’ll need a dog wash tub that can handle a range of dog sizes. Not only that, but the constant use can sometimes mean that domestic dog wash tubs will wear out sooner- so be sure to grab one that can easily withstand constant use. Of course, if you just want a dog bath tub for your own pooch, you should get one that fits around you and your home. They don’t need to be as hard-wearing and you won’t have to worry about cleanliness as much, since you won’t be using the bathtub for multiple dogs in a day. It might be easier for some to have their bathtub for dogs based outdoors, as you can make a bit more of a mess and even use your own hose- just make sure it’s warm enough for your dog to take a bath, without becoming ill through extreme weather temperatures. Naturally, an indoor bath would be better for commercial purposes, since you’ll likely have a dedicated space to offer your dog bath. That said, if the bath is for your own dog, you can still use your new bathtub for dogs indoors, as long as you are aware of the potential splash zone. This is important, not just for your dog(s) but for you, too. A dog wash tub that’s based on the ground means you’re likely to need to be bent over for a longer period, which can cause damage to your back if you’re cleaning your dog regularly. Of course, a lower tub can be better for dogs who suffer with joint pain and are averse to jumping into the tub. If you think you’re better with a higher tub, you can always invest in a dog ramp or simply lift the dogs into place. It’s also important that you get a tub that can handle the weight of a dog, plus the weight of water, as the tub fills and the dog’s fur will hold a lot of moisture. Pay attention to weight guides with your purchase and always give yourself a little extra room- especially if the dog bath is for a business. A hose- Great for getting into all those tougher spots, such as between the legs. Hoses are also more accurate, so you’re less likely to get water in their ears or over their face with this. Storage- Easily the best way to get everything ready before you start, storage means you won’t be spending time away from your dog, while you jump back-and-forth to get your dog shampoo etc. We’ve discussed the benefits of adding a little height to your tub already but, just to reiterate, having a bathtub at the right height for both you and your dog will be so much easier on your back. Not only that, but you’ll be able to reach all the areas that need cleaning, much better. Having a dedicated space to wash your dog means you’re less likely to leave everything lying around, since everything you need will be to hand. Not only that, but you’ll find that you dog will learn that heading toward this space means bath time. 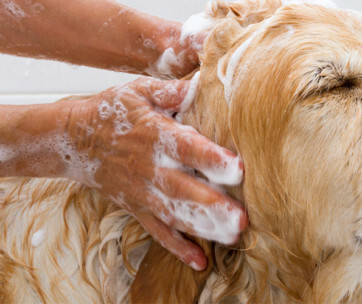 This, in turn, will lead to your dog being better behaved regarding their bath, as they love a good dose of routine- essentially, you’ll be training your dog to know how to behave when it’s time for a scrub! Having a dog wash tub means that it is so much easier to clean your dog than it would be in a standard bath- or outside with the hose, whichever your current preference is! You’ll also be less likely to bring mud into the house, since you won’t be taking your dog through the house and into the bathroom. Simply pop your dog bath somewhere that is easily accessible from outside- or use a shed, garage or similar to house your new bath. 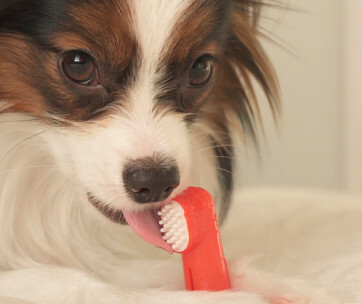 Brush your dog before starting- This will help get rid of any tough knots or tangles. It’ll also stop lots of loose hair getting into the drain and plugging-up your new dog bath! Always make this a fun experience for your dog- Dog’s react to positive reinforcement, so bring along plenty of treats and maybe a toy that they’re particularly fond of. Always remain calm- Dogs take their cue from their humans, so a nervous human will make a nervous dog and vice versa. Even if your dog looks a little stressed, use a happy, calm voice and maintain your course of action. Get everything ready- Your dog will immediately take the opportunity to jump out of their wash tub if you leave their side to go and grab something you need, so get all of your lotions and potions together before starting. 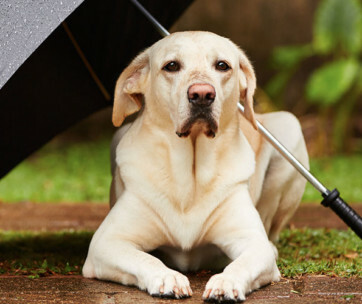 Use warm water- Dogs have very sensitive skin and water can easily become too hot for them. Test the water on the inside of your wrist before using it on your dog. It should be lukewarm, but not hot or cold. Don’t over-compensate by stroking your dog too much- To you and I, some gentle touch can be very reassuring, but to some dogs, being stroked is another way or winding them up and getting them ready to pounce. A gentle ear scratch will do much more good than rigorous stroking! If your dog is scared or panicking, stop- Unless they are covered head-to-toe in something that you need to get off them, immediately, you should always stop if your dog is very averse to something. Forcing them to continue will only reinforce the fact that they do not like the bath and will cause them to preemptively panic, next time. Try using lots of treats and gentle encouragement, throughout the procedure, so that they know they are getting spoiled, instead. Q: How do I install my dog bathtub? A: Freestanding dog bath tubs, such as the ones on our top picks, are much easier to install than built-in dog baths, which require a plumber- and perhaps a decorator and tiler, too. This is purely because the water will be coming through a shower head on your mains and requires a certified plumber to install, without losing pressure elsewhere in the home or causing any accidents. 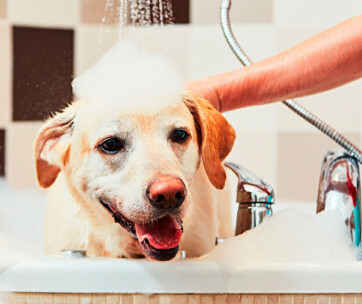 If you’re getting a freestanding dog bath in place of your utility sink or similar, you might also need to do some basic plumbing. For this, you can use the hot and cold pipes that usually run to your sink and simply attach them in the same way you would with your kitchen faucet. Q: Are any of these big enough for my large dog? A: All of our top picks have been chosen because they are incredibly versatile, and can match a range of needs, including the size of the average dog. If you have a wolf-dog or similar, it’s unlikely that they’ll fit many of these options- but for most dogs, including German Shepherds for example, these will suit your house- and pets- just fine. Q: Can I bathe my dog once a week? A: Each dog will have their own particular needs, as well as their own preferences, of course. If you have a dog with a skin condition, it’s best to chat to a vet before grooming, as you’ll want to be sure that any and all products used will be safe for their skin. You should also bathe your dog less frequently if they have dry skin or fur, as you’ll likely just be washing out the natural oils that your dog needs to have healthy skin! Unless your vet has suggested more frequent bathing for a medical reason, you should only really bathe your dog when necessary. Remember that all dogs will have a smell, which shouldn’t be unpleasant, and that if you notice your dog starting to smell more, but can’t find an environmental reason for it, you should make an appointment with your vet. Q: Can I bathe my sick dog? A: As a rule, if you dog is sick, you should always consult with your vet, first. If, however, they have given your dog the all-clear, then there is no reason as to why you shouldn’t be able to bathe your sick dog. Just be sure to keep the water temperature at an agreeable level, so you don’t make them too cold or too hot- and be sure to get them dry as soon as possible. A lightweight, easy-to-assemble and affordable option, the Booster Bath is easily our top pick as one of the most user-friendly dog bathtubs on the market, today. The minor assembly is as easy as snapping the legs into position and it’s just as easy to break down and stow away, when not in use. 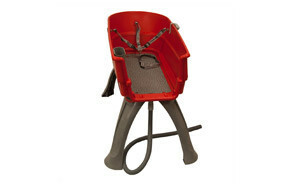 Despite it’s simple build and light construction, the Booster Bath is sturdy enough to handle most dogs and the three-point harness is a great way of ensuring your dog doesn’t slip and slide everywhere as you scrub them down. Not only this, but it can handle up to 125lbs of canine- more than enough for most household pets!